INDIA . 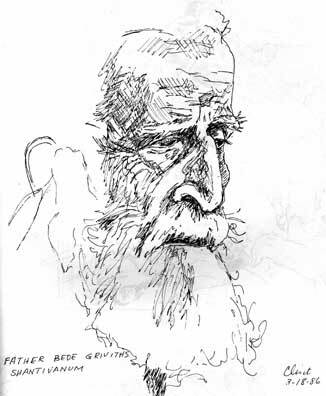 .Father Bede Griffiths. . A Catholic Benedictine, he founded the Ashram at Shantivarum not to spread Christianity, but to unify it with Hindu practice. His interfaith practice inspires me as an example of religion unifying mankind. We spend several weeks here, in meditaiton and ritual. Greg and I feel privileged when he allows us to paint him while he meditates with open eyes. During one long discussion on enlightenment and salvation he answers me, "Yes, I believe it is possible to contact God through the Catholic Church."